Other than your face, your hair is one of the first things that other people noticed, this very reason is why most people take extra effort in caring for their mane but are you doing enough? A hair salon is one of the usual places that a person would go to whenever they need to have their hair fixed, this is typical if you just need relief from a bad hair day or to mend your split ends. What if your hair needs a more extensive solution such as for your hair loss? Several factors can cause hair loss and understand your lifestyle pattern may help remedy your condition. · Stress is the most common factor in temporary hair loss. · Autoimmune diseases such as Alopecia. Say goodbye to hair loss and scalp problems with Novuhair, natures answer to hair loss. Novuhair is made with 19 natural ingredients that include moringa oleifera, panax ginseng, virgin coconut oil and the natural essences of rosemary and peppermint and almost 100% natural. Novuhair nourishes the scalp and hair by increasing the flow of nutrients and improving blood circulation to the scalp. Novuhair also helps hydrate the scalp, maintain the hair’s natural luster and prevent early hair graying hair dryness and itching. It also penetrates deep to rejuvenate the hair follicles, provides optimum nutrition to help combat hair loss and/or thinning of hair, improves blood circulation in the scalp which contributes to the stimulation of hair growth. This new year, give your hair a resolution and have your hair and scalp analyzed to check for problems. 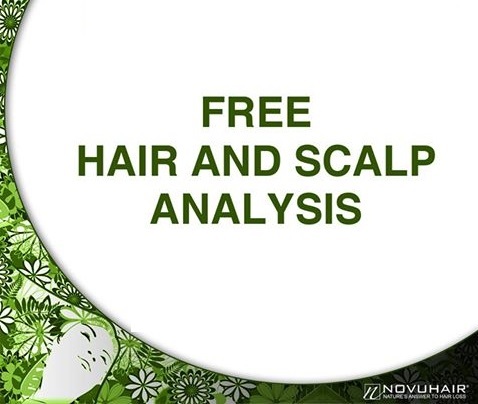 Novuhair, is offering a series of free hair and scalp analysis is various locations, check their monthly schedule at www.novuhair.com, Facebook page: www.facebook.com/NovuhairOfficial, Instagram: @NovuhairOfficial or on Twitter: @NovuhairNatural. You may also call the Novuhair hotlines at 4136570 and 09228830575. Novuhair Topical Scalp Lotion, Shampoo, and Conditioner are available in all Mercury Drug Stores and other leading drug stores nationwide. For online purchases, visit Lazada.com.ph and regaloservice.com.